The first World War (1914 -1918) was called “The Great War” and “the war to end all wars.” While that war did not give us permanent peace, it did give us some stunning artwork commemorating the Red Cross nurses who served. Those nurses were revered. They were bold, noble, and patriotic. Suddenly nursing was celebrated in song and verse. World-famous artists were commissioned to capture nurses on canvas. Nurses became cover girls, wrote advice columns for popular magazines, and endorsed products. Every paper doll set had a nurse’s uniform and little girls dressed as Red Cross nurses even helped roll bandages for the war effort. My name is Melodie Chenevert. Three years ago I opened the Lost Art of Nursing Museum in Cannon Beach, Oregon. 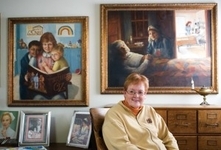 I’d been a nurse for 50 years and a collector of nursing memorabilia for 35 of those years. I called it the “lost art of nursing” because so many of the posters, magazine covers, illustrations, advertisements, poems, sheet music, dolls, toys, and books have vanished. As hospitals and schools of nursing modernized and redecorated, artwork celebrating nursing traditions and its history wound up in the trash. As soon as I opened the museum, I began getting requests from hospitals and historical societies asking if I could loan them something for display. No, I couldn’t. It seemed a daunting task and I worried that my items might be lost or damaged. It was frustrating not to be able to help them. I began to wonder if there might be a way to re-create some vintage artwork that could actually go on tour. Luckily, I met Jim Mercier, a perfectionistic curmudgeon who is even older than I am. He does fine arts printing for artists and galleries. He agreed to help me with my experiments. I gave him some postcards, calendars, and magazine illustrations from the WWI era. He did a masterful job of repairing damage, restoring colors, and enlarging the images for optimum impact. I had him put them on canvas so they would be lighter weight and easier to ship and hang. Pieces, some as small as a postcard, have now becomes canvases as large as 22 x 30”. All are gicleé prints. Gicleé is a French word meaning “to spray.” They are done with pigments instead of dyes and are supposed to last 100 years or more. amazing, awesome, inspiring, excellent, enjoyable, educational, fabulous, fascinating, fun, and WOW! The most frequent phrase is, “Thank you!”… for sharing …for keeping the spirit of nursing alive … for honoring our profession in such a wonderful way. While the museum and the art exhibit are quite different, both will fill nurses with pride and hopefully spark new interest in the history of nursing. It’s an exhibit that will be enjoyed, not only by nurses, but by patients and their families, professional colleagues, history buffs, artists, students, and veterans. See write ups and pictures of the museum under News and Events! Contact us if you would be interested in having the exhibit come to your hospital, school of nursing, organization, or professional event.